This is the first HiRISE image to contain the Mars Exploration Rover Opportunity’s landing site in color. The lander, parachute, and heat shield that took Opportunity safely to the surface are still where the rover left them, and this color view reveals subtle details of the disturbed ground around the hardware. The color of the hardware sets it apart from the natural rocks and sand of Meridiani Planum. 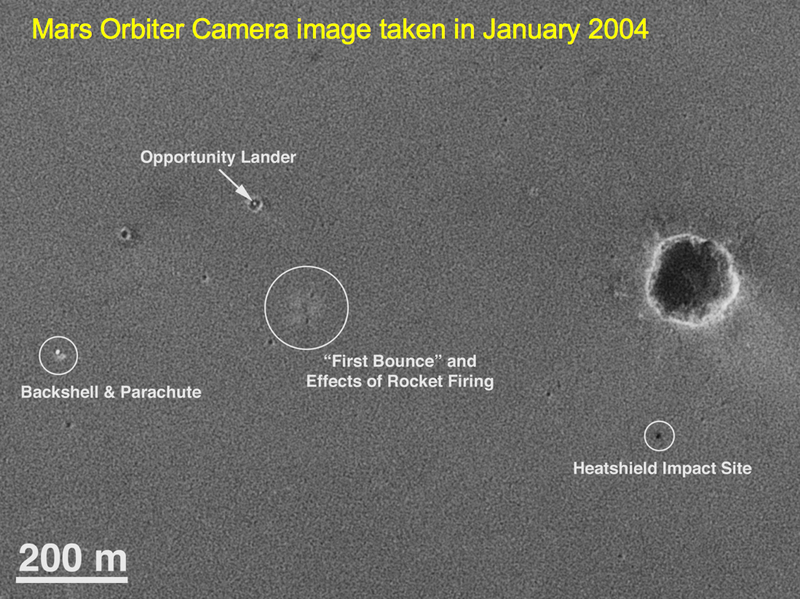 The first image of Opportunity’s landing site taken after landing was acquired by the Mars Orbiter Camera on Mars Global Surveyor in 2004. 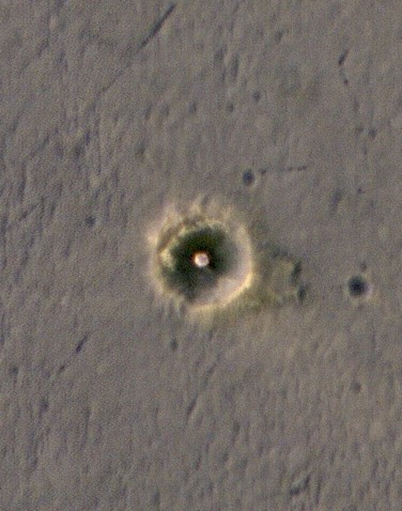 HiRISE first imaged the area in November 2006 over 1 Mars year after landing. 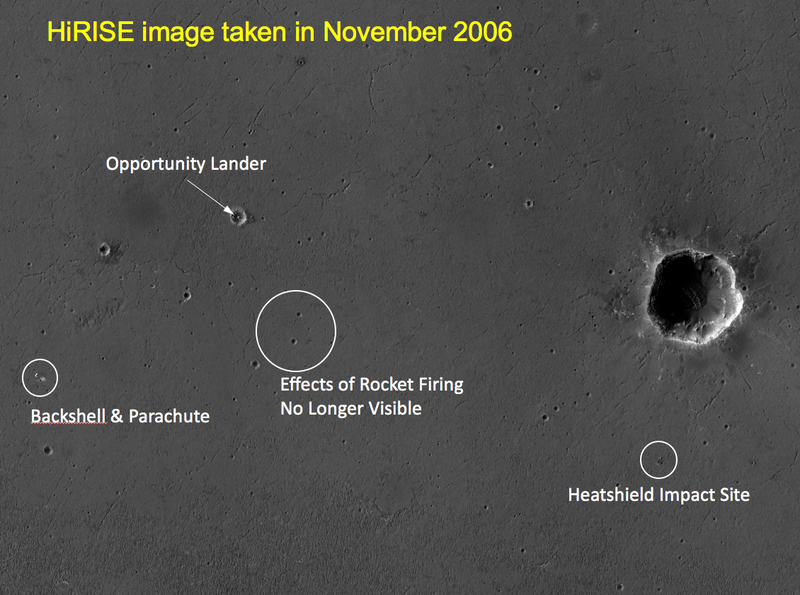 This image shows changes relative to the MOC image, including erasure of the marks made by the landing rockets where the airbag-shrouded lander first bounced on the surface. The lander is visible as a darker center amid the reddish airbags, resting at the center of the bowl of Eagle Crater. (Compare this view from orbit with the Opportunity Pancam color mosaic taken as the rover left Eagle Crater.) The crumpled parachute remains attached to the bluish backshell, which has possible signs of windstreaks developing downwind of it. An arc of slightly darker ground extends clockwise from the present position of the parachute, a sign that the parachute has blown around in the wind, although it does not appear to have changed much since the first time we imaged it in black and white. Other, brighter signs of the backshell’s landing have faded with time. Away from the color swath, the crash site of the heat shield has also faded with time. Again, while dark traces remain, the lighter “splats” around the hardware visible earlier are no longer apparent. 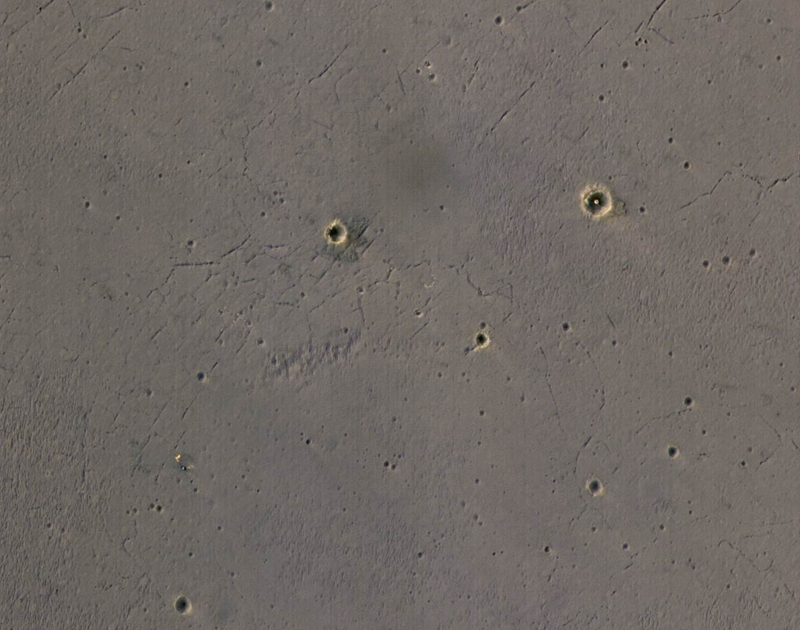 This image fills a gap in HiRISE’s color coverage of the Opportunity landing site, its traverse eastward from Eagle and southward from Endurance craters. But few signs of Opportunity’s tracks are now visible: they have been obliterated by the Martian wind in the decade or more since the rover created them.